An exhaustive SEO audit is the operative base of a successful SEO process since it allows you to not only identify which aspects of the site need to be optimized from a technical and content perspective to improve its crawlability, indexability and relevancy, but also to understand the “platform” of your client Web business, detect linkable assets opportunities and assimilate its unique selling proposition that will definitely help you to develop much more consistent and effective link building strategies that align and make the most out of each available opportunity. Because of its importance it’s fundamental not only to identify and include all what is relevant for the SEO process, but also to communicate all these findings and recommendations effectively in order to generate the desired actions. Some days ago Geoff Kenyon published a post named “Improving your SEO audits” that made me realize how thanks to the way I had changed and polished over time the way I organize and present my SEO audit reports I achieve much more effective results now than when I started some years ago. Are easily understandable to the stakeholders: Independently to their background, whether they’re business or technical oriented. Drive an accurate implementation: Clearly prioritizing and communicating the required actions, specifying the type of needed support. Facilitate the follow-up: Providing the required information that will serve as an SEO implementation schedule and guide. As important as the title and site name the version of the document is fundamental to include along with the date when it was presented since you might need to create many audits or revisions for specific areas of the site at different times. An index that helps the readers to easily navigate through the document. An introduction that clearly communicates the goals that are followed with the SEO audit and recommendations, how it’s organized in two sections, one purely technical (that will only require technical support) and other with content related recommendations (that might also need technical support for their implementation but focuses on the site relevancy and requires a content input or validation) and who should implement the recommendations, if they’re content related then the editorial, communications or marketing department (depending on the company structure) and if the recommendations are technical then de development team or provider. 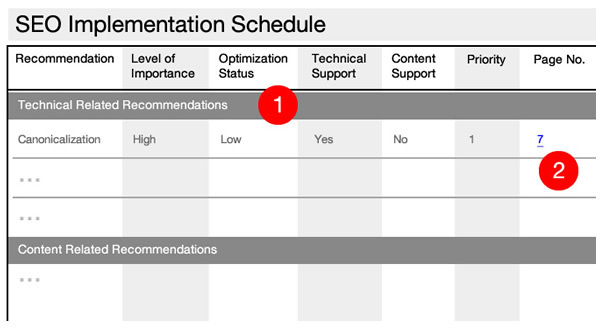 A table that summarizes all the analyzed elements, including for each of the recommendations their level of importance as an SEO factor (High, Medium or Low), optimization status (High if it’s optimized and doesn’t need to be improved, Medium for those moderately optimized with room for improvement and Low if it’s non-optimized, along with a consistent color code system to help their identification) and desired implementation priority (using a value system that should be explained, such as numbers in ascending order, starting with the highest priority), along with the required type of support, technical or content and the page where each of them can be found. This summary will be helpful to quickly transmit which are the most important issues that need to be solved on the site and the required resources to do it. To give a priority for each recommendation you need to take their present situation (how optimized each of them are at the moment) and their importance to achieve the SEO process goals (how important each one of them are as an SEO factor) and start prioritizing those that are highly important and are not optimized. All the purely technical recommendations (such as those that have to do with canonicalization, site crawlability and indexability, structured data implementation, etc.) that don’t required any content input and that can be directly done by the development team, will be organized together. 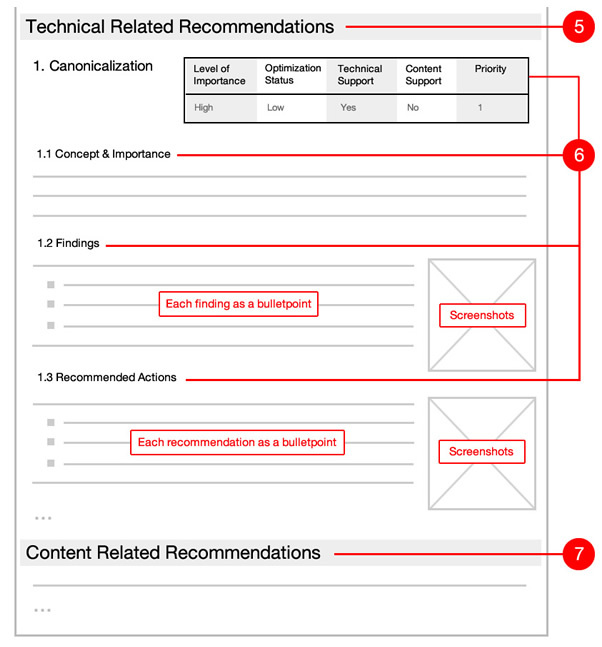 This will help to better divide the activities for their implementation and make the document easier to read for the different type of audiences. Each aspect that has been analyzed will have its own recommendations section that will include the summary table only for itself at the beginning (in case someone goes directly to read it and want to quickly know its status and importance level) and will always feature its concept -explained in a concise way that transmits why it’s important in the SEO process, how it will help to achieve its results-, the findings from the audit organizing each related finding in bullet points along with screenshots showing and explaining them with a positive approach (focusing on how these can be improved instead of how bad they are, remember that this document will also be read by the development team and you don’t want them to see this as criticism to their work) and the recommended actions, each of them in a bullet point with specific steps to take along with examples, in order to improve the identified aspects and fix the issues that have been found. All of the analyzed aspects that required a content input and have to do with the site relevancy should be included in the “Content related recommendations” area. Keep in mind that these are not all the content improvements or development that you will need to do, there are going to be others included specified in content strategies to enhance the site attractiveness, to create linkable assets, to optimize and improve towards its linkability –that are developed iteratively along the SEO process with a link building perspective– but those identified at the beginning to have an optimized content base. 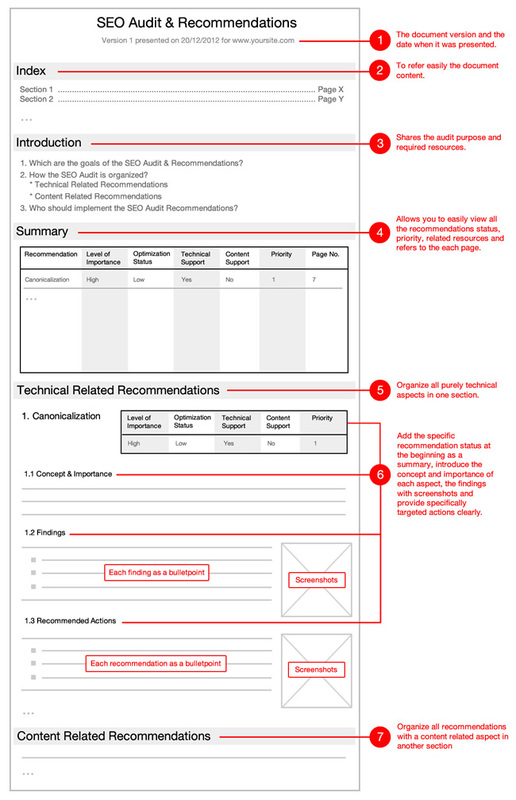 The recommendations included in this area will need content input for their development –such as the improvement of titles, unique and descriptive text content in each relevant page, etc.–, whether it is from the editorial, communications or marketing team -additionally to the technical team if required, in case that the changes cannot be implemented through a panel but directly in the code-. After having presented the SEO audit and recommendations report you can share it with Google Docs to allow comments, questions and feedback from all of the involved parties and have it there published as an easy-to-access reference. You can create this table with Google Spreadsheets and share it with the SEO process stakeholders so they can fill it with the implementation related information and then you can also do the same with the validation and status one as the process advance. Split the recommendations in technical and content related aspects to keep consistency with the SEO report and each stakeholder can easily identify the relevant activities to follow. Add a link from the page numbers to the Google Docs where you have shared the SEO audit report so it’s easier to refer to. For all the recommendations include a start and end date, that should be planned and filled by the stakeholder in charge of developing them (from the technical, content or marketing team). Like this you can effectively follow-up each one of the recommended aspects. When you have the implementation dates you will be able to coordinate, allocating time to validate each development in a closed environment before it’s launched. Finally, include a status field showing if each recommendation has been published, is in process or still pending, using also a color system allowing to easily follow the advancement. As I commented before thanks to the way these documents have evolved I have achieved a higher effectiveness in my work although they are and always will be in an evolving process as a consequence of how our sector changes, the type of aspects and elements we evaluate and improve to achieve the desired organic visibility and conversions for our clients, the people involved in the process, how we communicate with clients, the tools we use for our work, and of course, our own experience in our work. 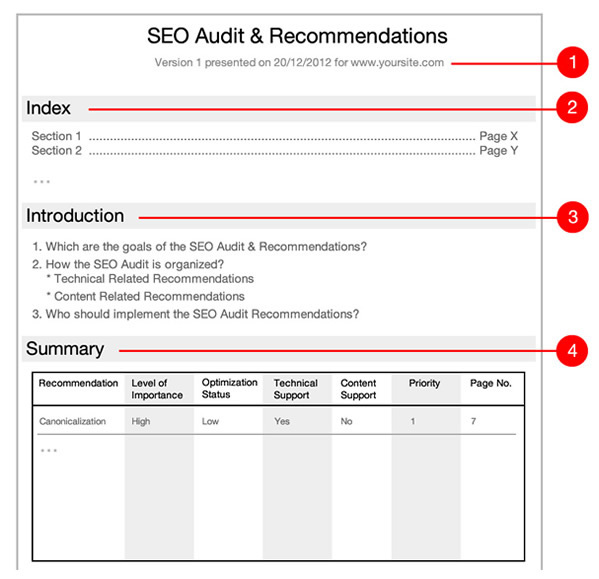 If you’ve liked them and think might be also useful in your SEO projects you can download a bigger version of the SEO audit report template and the SEO implementation schedule template. In your case, which are the elements that you have changed over time in your SEO Audit reports to improve their results? Is there excel template for above ? these are in jpg. Great format – I love it! Is there any chance you’d share your template in Word format? Awesome! Stopping by was definitely worth!